Customer satisfaction has always been the key to long-term success and with the increasing use of apps and social sites that customers use to see reviews before they buy, customer satisfaction is now important for short-term growth as well. There’s no perfect way to measure customer sentiment across the customer journey, but there are several metrics that, used together, can help you understand how your customers are feeling throughout their experiences with your product. CSAT (Customer Satisfaction Score) is one of the preferred metrics and it allows you to understand a customer’s sentiment toward a specific interaction with your site, product, or service. 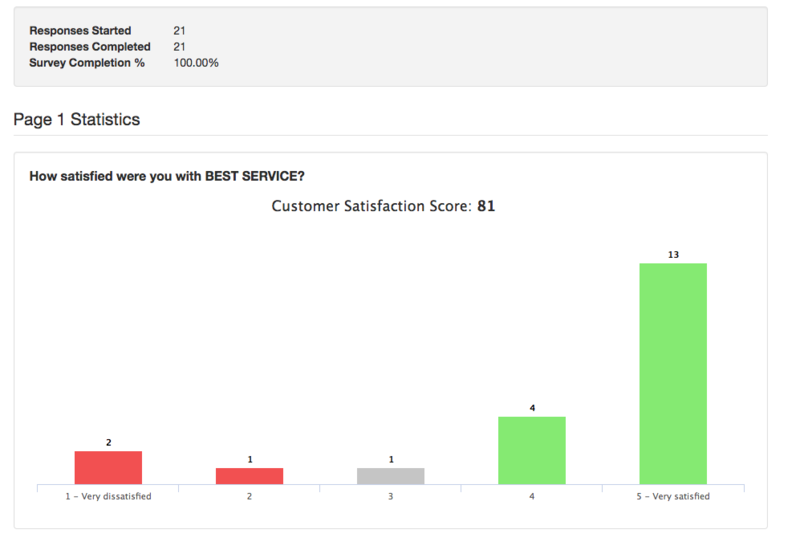 For example, a CSAT survey can be sent to customers after their experience with your customer support team. This can help you understand how successful your customer support department (and the individuals within it) are at helping customers. CSAT is measured through a simple, one-question survey. A CSAT question simply asks customers “How satisfied were you with [the interaction]?” and asks them to give a rating from 1 to 5. Click below to see an example. After the responses are tallied up, SurveyTown does the CSAT score calculation for you. Our platform will give you a score like the one pictured below. CSAT surveys should be given when interactions are still fresh in your customers’ minds. Asking immediately after interactions will result in a higher response rate and more accurate results. 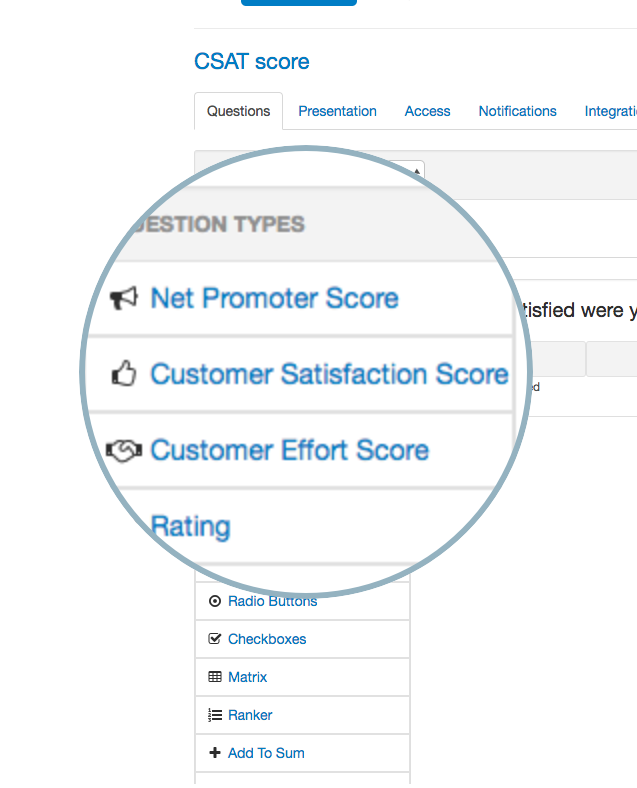 With SurveyTown’s support, you can embed your CSAT questions directly in emails sent immediately after purchases or other interactions. There’s no need to take up hours of developer time to get things running—the process is made easy because we provide the HTML for you to add to your email templates. Tracking CSAT as a KPI over time is important, but what’s more important is what you do with the information you receive. Most professionals agree that its best to follow up with customers who provide a rating of 3 or less. 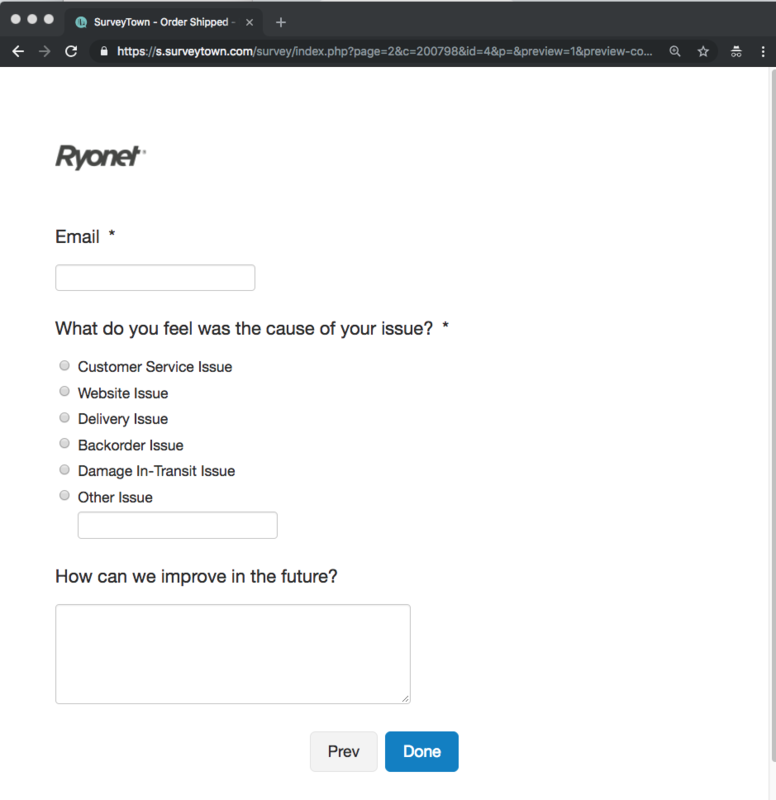 You can set up SurveyTown surveys to alert company personnel to these negative reviews via email so they can pro-actively solve customer problems. Asking additional questions after the initial CSAT rating question can help you narrow in on specific problems. With SurveyTown you can set things up so that customers who provide certain ratings are automatically sent to a landing page for additional questions and feedback. This additional feedback will help your customer support team to understand the situation and better enable them to help with customers’ problems. Your company can use CSAT to understand how it’s meeting customer expectations for specific processes, products, and interactions. Following up with additional questions for less-satisfied customers can help your team pinpoint problems and keeping track of common trends in these problems among customers can help you identify areas for product improvement. When you do make product improvements, make sure to let your customers know so that they know you’ve been listening and taking their feedback to heart. By helping them feel heard, you might win some serious brownie points and bring customers from passive customers to brand advocates. We’ve worked hard to ensure that creating CSAT surveys with SurveyTown a short and simple process that requires little to no developer time. You can quickly create a Customer Satisfaction Score (CSAT) survey by dragging and dropping a Customer Satisfaction Score question into a new survey. We automatically create the question text for you, and you can choose whether or not to customize the survey with additional questions. We recommend adding a comment box for customers to explain why they gave the score they did. Once created, we provide you with a URL that you can post on your website. If you want to embed the CSAT question in an email, we also provide you with the HTML that you can embed in an email. Once your customers answer the survey question, their answers will be added to a report that you can see in our interface. Your results can also be received via our Webhooks or retrieved via our API.